Runners with a cause - and cool T-shirts! Go Team Shalva! Abba - making it look easy! YAY! Abba crossed the finish line as did Zia Em, Renee, Jes, Alisha and Mati and thousands of other runners. 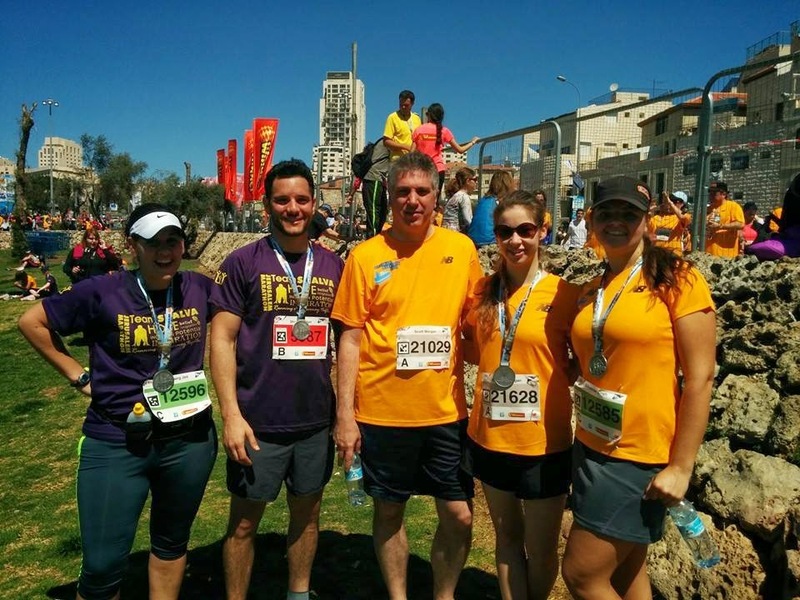 But mommy and Rob were the winners of the whole 2014 Jerusalem Marathon day: They managed to keep Lucas, Raia and myself alive and from completely melting down for about an hour while waiting for abba's Jerusalem 10k debut at the finish line. Now this was more than a week ago and yet it hasn't made the blog yet. That is because, as you know, we babies have a way of driving a wedge between our parents and their computers and that was the case for over a week as I prevented mommy from posting my blogs. 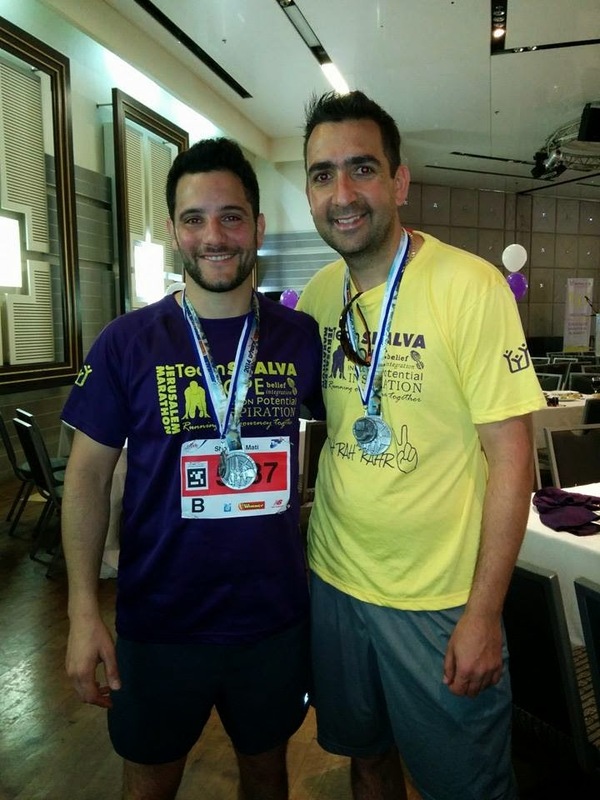 I wanted to thank you again for your support in my 10k run for Shalva. I had a great time running this race and will plan on running the Half marathon next year. 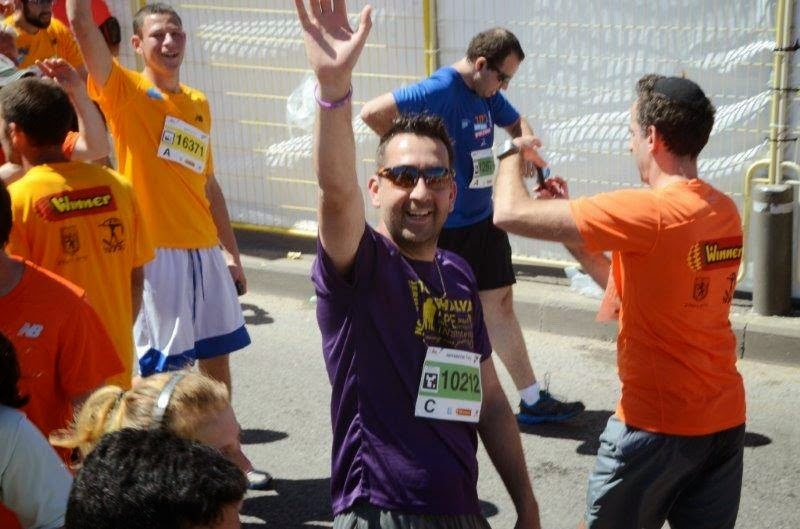 I was very blessed to be running for team Shalva but your support was not only a blessing to me but more for the children of Shalva. Shalva is a growing organization and are in need of your financial support to continue the great work they are doing. On March 21, abba and our other friends tackled the hills, the heat and the hoards of runners during the race. But the true marathon was the one headed up by mommy with Rob coming to her rescue: somehow getting three kids - babies in strollers basically - to the finish line. Babies who, if they walk, demand to go their own way or flop to the ground in protest. Babies who are on the edge of a meltdown if their needs or desires aren't instantly met. And babies who apply the Law of Babies to all situations in which they find themselves. about babies arriving at the finish line? And herein lies the true story. 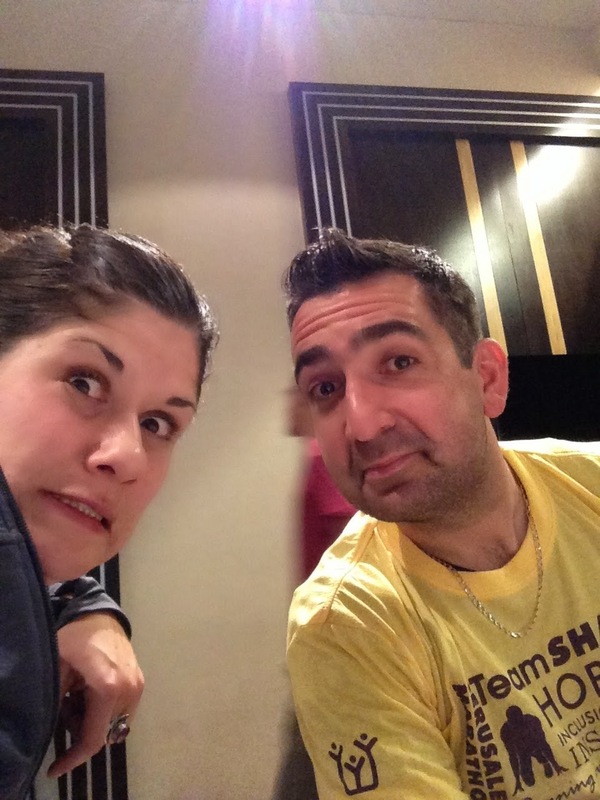 It all began when we were ushered into a hotel room the night before the race. What new discoveries awaited us! An entirely new room for our search and destroy missions! Bureaus upon which to climb. A TV and all sorts of outlets at our perfect height. And better yet, Lucas and I were to share a sofa bed which meant we could come and go without encountering those pesky child barriers that interfere with - but certainly do not prevent - our escapes from our normal beds. That night, the eve before his big race, abba slept one solid hour. The rest of the night hours were interrupted by cries, whimpers, massive and invasive dumps and the inevitable rising of babies before the sun. And this all occurred in one small room where there was escape from neither sound nor smell. And then, when he arose, just as refreshed and full of energy as we were I'm sure, abba and mommy whisked us off to breakfast where they watched us annihilate the buffet all the while trying to prevent plates and glasses from flying or silverware, such as knives, to be mishandled. Never mind the humus embedded in our clothing and Lucas' swiping of abba's pineapples and almonds when he wasn't looking. 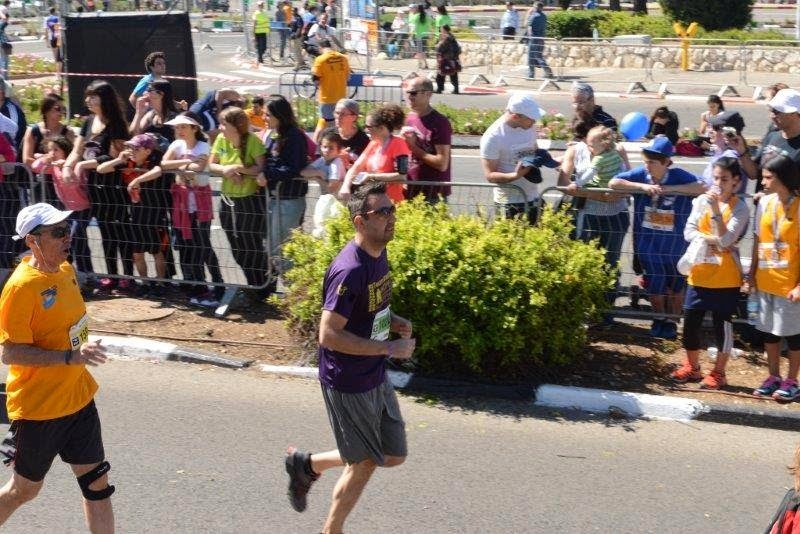 Then our parents escorted us the 20 minutes all the way to the starting line where we watched the endless stream of runners take off and Lucas nearly snuck into the start area with the Jerusalem Mayor Nir Barkat. Barkat cut through these very gates to start his run. After this nerve-wracking couple of hours abba was supposed to run the race of his life and mommy was supposed to, essentially, herd cats/babies along with Rob who helped the herding process. It took about 30 minutes to get to the finish line which should only be 10 minutes away. We made it with time to spare to see abba gracefully swoop into the finish line. In the end, everyone was a winner, just some people were more weary than others, basically anyone older than 4 years. And then those weary adults shuttled us to the Shalva victory lunch where we ran about 42.2 kilometers around the tables in the auditorium as we wavered between hunger and indefatigable exhaustion. We ultimately found ourselves in a wreath of balloons that we dragged across the hotel and ended up somehow in the bathroom. Where was Raia in all of this? Quiet and well behaved in her stroller making Lucas and I look very naughty and needy. Hmph! After all that non-running running around, Mommy has a new idea for next year: not just Run for Team Shalva, but BABYSIT for Team Shalva! She contends that running a marathon would be easier than herding the three of us to another finish line.